Create an all-year-round outdoor living space! 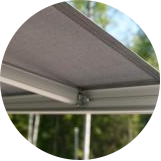 Ziptrak Alfresco Blinds keep you cool in summer and warm in winter. 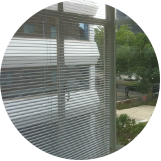 Window Cover Solutions quotes, supplies and installs custom made Ziptrak blinds. Call us today for a free quote! 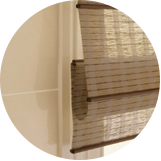 View our extensive range of quality window furnishings to suit any budget. Our professional consultants and mobile showrooms will come to you accross Melbourne! We’ll give you the right advice and help you choose the perfect blinds, curtains, shutters and awnings - all from the comfort of your own home. With an experienced team of installers servicing the Northern suburbs of Whittlesea, Doreen, Mernda and all throughout Melbourne, the perfect solution is only a phone call away! For a free quotation and in-home design consultation, fill in this form and receive a 5% discount off your total order! Our Whittlesea decorator and mobile showroom will visit you throughout Mernda, Doreen and the greater Melbourne area with all the right advice and lots of great ideas. Book a FREE consultation online and receive 5% OFF! We have an extensive range to suit every Melbourne home and room. From classic curtains and modern blinds to innovative outdoor products , we've got you covered inside and out! 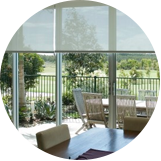 Ideal and practical solutions for every Melbourne window - covering all style, light and privacy needs. Create extra outdoor rooms in your Whittlesea home! We'll help you shade your windows and save on energy bills. Convenient, safe, modern and affordable for your Melbourne home. Newest of motorisation technologies available. Years of experience in the northern suburbs of Melbourne in commercial, schools and universities. We would like to thank Window Cover Solutions for furnishing our new home with beautiful curtains and roman blinds. We have had many comments on how stylish they look and we are so pleased with the aesthetic result, as well as the excellent insulation they provide. We highly and happily recommend their services to all our family and friends.